Nowadays you can hear, see, or find numerous articles and even books about the end of the 2012. All of them provide different sources of information.However, most of them have the same conclusion that there is going to be some sort of end in 2012. Most of them agree that there is something significant that is going to happen, which can be true only in the part that there is some sort of significance in the end of this year. However, most of the information are pure speculations derived from different backgrounds, backed up by unknown sources in order to justify their speculations. Can they be completely true? There is no way of proving it as a real fact, thus they simply become one of the many speculations. Sadly, most people are easily influenced without taking a second look and they believe in whatever is given to them. That our minds are easily corrupted. Anyone who knows how to make something sound real and is able to show some sort of source to base their words on can easily take the attention of the mind. And frankly, that's all that it takes. Once your attention is already taken by them, your mind will fill in the gaps by itself to make a full image of it. Nonetheless, it still stays only as a belief, not the true and direct experience of yours. And let's be clear, belief is not the reality. Reality is based on our immediate direct experience and we definitely can not trust our mind for that. It does not even agree with itself, and it always has doubts that can be easily created again with something that sounds 'real' like some sources which look to be convincingly 'true'. All of it however, is only a story of our minds. But is the story of our minds true? That can be easily tested by simply sitting still even just for a few minutes and observing what the mind will start immediately telling you. 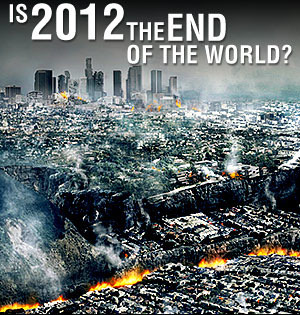 So what is true about the end of 2012? The truth is that something significant can happen, and the most significant thing that could happen is your full realization of the Self. So that no matter what would happen by the end of the 2012, it will be simply observed as one of the phenomenons happening within you. And that can be tested with your own direct experience, which will become fact and truth to you immediately once seen. So instead of focusing your attention on speculations, fear, or even hopes created by the masses, you should focus it onto yourself and ask yourself, 'Who is the one who will experience it?' It's clearly not your mind, because your mind already is experiencing all of the false information given to it, and you are observing it. So if it is not your mind experiencing it, but it is still you, Who then are you, the one seeing the experience of it? Make it very simple to yourself and with your conscious attention reflect on this. Finding this out will be the end of the world you know, and yet the beginning of a something new and so beautiful that it can not even be put into words. Before any experience, thought or idea, find out who is the one having it? See where it takes you, because it will take you beyond everything that can be found or seen. And that is truly the greatest significant event that can happen not even by the end of 2012, but Now, Here. Have any questions? Comment or send me a message and I will be sure to answer all of your concerns.